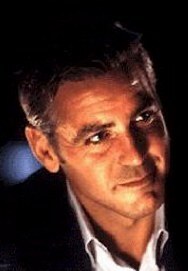 George Clooney plays Danny Ocean, the recently-paroled and recently-divorced ringleader of the complex, daring and some say suicidalraid on Terry Benedict's casinos. "The reason George Clooney is perfect as Danny Ocean is that George is a born leader," producer Jerry Weintraub says. "He's a wonderful actor and he helped keep the sense of fun during filming — even after we wrapped for the day." In Ocean's Eleven, wry, charismatic con man Danny Ocean (George Clooney) is paroled from prison and immediately begins orchestrating his latest plan — to pull off the most daring heist in the history of Las Vegas. The target? Three of the most popular casinos on the Vegas Strip: The Bellagio, the Mirage and the MGM Grand. Secured beneath 200 feet of solid earth below the Strip is a vault that safeguards every dime that comes through these three casinos, which happen to be owned by Terry Benedict (Andy Garcia), an elegant, ruthless entrepreneur. As smart as he is ruthless, Benedict doesn't hesitate to do whatever he thinks is necessary to get what he wants — be it hotel or girl. In this case, it happens to be Reuben Tishkoff's (Elliot Gould) beloved hotel and Danny Ocean's ex-wife Tess (Julia Roberts, who has moved to Las Vegas to begin a new life as curator of the Bellagio's Art Gallery. Saul Bloom (Carl Reiner), who thought he was retired from the flimflam; Livingston Dell (Eddie Jemison), the eyes and ears of the team, whose work on both sides of the law has made him a surveillance expert capable of tapping into the most sophisticated security system; and Yen (Shaobo Qin), a Chinese acrobat whose unique talents make him the perfect grease man. The take? Because the Nevada Gaming commission stipulates that a casino must hold in reserve enough cash to cover every chip at play on its floor, on a fight night, the vault is certain to contain at least $150 million. $150 million. Divided by 11. You do the math. 11 men, three casinos, all at once, in one daring holdup. In any other town, they'd be bad guys. Brad Pitt plays Rusty Ryan, Danny Ocean's confidante and right-hand man. "Danny and Rusty are old school," screenwriter Ted Griffin explains. "They're guys who live by a code, which now seems a little outdated. They're like modern gunslingers after the west has been civilized. Danny is the idea guy and Rusty is the detail man. Danny can sell you anything, but he has a lot of blind sides and Rusty tends to watch out for him. He knows when Danny's going to screw up about two steps before Danny knows it." "Rusty wants to be part of the team," says Soderbergh, "because he's been out of the big game for a while and is anxious to get back working on the level that he knows he ought to be working. When we meet him, he's doing things that are beneath him. This is an opportunity for him to step back into the game that he ought to be playing." According to Pitt, "the reason Rusty agrees to the caper is that he's flat-lined in his life. He's gone from the top of his game to running a poker school for teen heartthrobs. When Danny shows up with his plan to rob three casinos, Rusty's ready to jump in. Even if he does think it's impossible." "Brad Pitt is perfect as Rusty," Weintraub comments. He's not only a cool guy, he has that devil-may-care attitude that Rusty has." Matt Damon plays Linus Caldwell, the talented newcomer with a legacy to live up to. "Matt Damon's character, Linus, is the new kid on the block," Griffin says. "He's the pledge who usually gets the worst things to do. But he earns his stripes through this heist." "I wanted to play this role because I didn't want the movie to come out and not be a part of it," Damon says. "Linus, whose father was a well-known grifter, has been around the con his entire life. He's got very quick hands and can lift anything from anybody. When Danny looks him up, Linus is small time, working alone picking pockets on the El in Chicago. He wants in on this heist because it will be the biggest score of all time and if they pull it off, people will be dining out on their names forever. They'll be set for life. And everybody wants to see Vegas get taken to a certain degree because everyone's got his own Vegas tale of woe. "What makes the story more interesting," Damon continues, "is that as the movie continues we realize the entire scam was never about the money for Danny. The whole thing is about getting his wife back, getting his life back. So at the end of the day, it's a great romance." Don Cheadle plays colorful explosives expert Basher Tarr. "Basher is brought in by Rusty," Cheadle says. "Basically, his job is to take out the power in Las Vegas for a very exact period of time. What stands in his way is the limitations of the technology they have to work with and the fact that they don't want to get caught. He has to figure out a way in which do it that's ingenious but at the same time undetectable." Cheadle, who starred opposite George Clooney in both Out of Sight and Fail Safe, has been described as "disappearing into his roles." When Soderbergh first approached him, Cheadle knew that he didn't want his role to be confused with his portrayal of Sammy Davis, Jr. in the acclaimed HBO movie The Rat Pack. 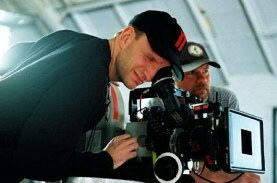 "Don was aware that in an earlier version of the script, Basher was a Cockney," says Soderbergh. "When he suggested going back to that, I agreed and it worked out very well." "Basher is probably the most expert at what he does of the characters," says Griffin. "I think he has a wild, political anarchist history. I believe he's there less for the money and more for the joy of pulling off an enormous job." Carl Reiner plays Saul Bloom, the ulcerous old pro who is brought out of retirement to play a crucial role in the heist. "I always imagined Saul to be like a woman who used to be asked out a lot and now isn't asked out at all, and hasn't been asked out in a long time but is still very proud," says Soderbergh. "When Saul is approached by Rusty, he feigns disinterest when in fact he desperately wants to be in on it. He's trying not to let on how much this caper means to him." "Saul is a loser," explains Reiner, who had previously worked with Jerry Weintraub when he directed the producer's comedy, Oh God! "Saul jumps at the chance to be a part of this winning team. In his heyday he was probably a brilliant con artist. When Rusty finds him, he doesn't even have enough money to play the horses — he's become a down and downtrodden dog track player. But Danny and Rusty know that he was a first-rate scam artist and they know he's an actor. And they can use that." In order to gain the confidence of Terry Benedict, Saul transforms himself into Lyman Zerga, a fierce businessman of indeterminate origin. "Saul knows exactly how to play Lyman Zerga," Reiner attests. "He's fully enjoying the role playing and being an integral part of the scheme. Mostly he loves being a big shot and placing his bets at the gaming tables in the high roller room. He can almost forget that it's not really his money!" Elliot Gould plays Reuben Tishkoff, the former Vegas hotel kingpin who is unceremoniously muscled out by slick entrepreneur Terry Benedict. "Reuben is from another era in Las Vegas," Gould explains. "At one time he had been the king of Vegas, but Terry Benedict effectively put him out of business. He couldn't compete with the Mirage, the MGM Grand and the Bellagio, so he had to sell out. And sell out for what Benedict wanted to buy him for. The final insult is that Benedict plans to demolish Tishkoff's hotel in order to build another monstrosity on the Strip. 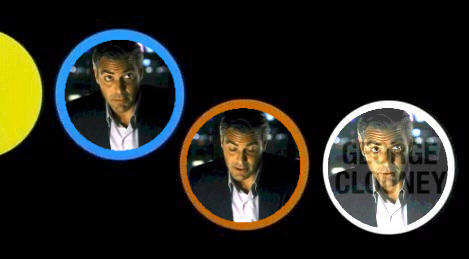 Tishkoff agrees to bankroll Danny Ocean and give him the necessary resources to accomplish the heist. The money means nothing to him — he wants to be a player again and he wants revenge." "Tishkoff has a personal investment in this heist," says Soderbergh. "He's been burned by Terry Benedict and wants to see him taken down. That's another thing that's fun in movies, to see a figure of authority, especially a figure of authority with a lot of money, get taken to the cleaners. It's hard not to be happy about that." Having Gould join the cast was a bonus for George Clooney, his former castmate on the 1984 TV sitcom E/R. "E/R was the first series I had ever been on, and Elliott taught me a lot about your behavior on the set," Clooney says. "He was the lead on that show and he treated everyone nicely and with respect, whether they were a regular cast member, a member of the crew or a guest star. He was a class act. Elliott showed me how well a set could be run if you're inclusive." Bernie Mac plays Frank Catton, a card dealer in Atlantic City and Danny's first recruit. "Frank is a con man looking for some action when Danny looks him up," says Bernie Mac of his character. "Because of time spent in the pen, he's been working at the Trump Plaza under the assumed name of Ramon Escalante. Danny approaches him because he needs an inside man at the Bellagio. Frank is looking to get out in a big way, so he arranges to be transferred to Las Vegas." "Bernie was the first actor of the group that I worked with," remembers Clooney. "We were in New Jersey and we were just starting the film. I'd seen him in a couple of his films and he was very, very funny. But this was an acting job. He had to play a character, and he had to play him straight yet still be funny. Bernie came in and he knocked this role out of the park. He is this incredibly talented actor who looks you straight in the eyes and makes you howl." Scott Caan and Casey Affleck play twin brothers Turk and Virgil Malloy, respectively, experts with cars and transportation. "The Malloys just want to drive cars around and argue," Soderbergh says. "That's what they live for. Being paid to do that is a fantasy for them." "Turk and Virgil have five or six incarnations during the course of the heist," says Griffin. "Their principal ability is driving, but they also become quick-change artists. These guys are based on a number of long drives I took as a kid with my brother in the back seat." Throughout the film," says Affleck, "Scott and I are arguing, fighting and pushing each other's buttons, which was really fun to play. But, despite their competitiveness, the brothers are a really effective team." "Casey and I like to work the same way," says Caan. "We started hanging out together and discovered that we both like to improvise — which Steven let us do from time to time. My favorite part in acting is the moment to moment. And that's what Casey is so good at. He one-ups me every time." Eddie Jemison plays surveillance specialist Livingston Dell, whose anxiety threatens the success of the heist. "Our ambition was to not have everybody be really cool in this movie," Griffin says. "And Eddie Jemison took that to heart. Livingston has had about five too many cups of coffee at all times. He's like the AV geek in high school." "Livingston is the ‘cool relief' in the movie," says Jemision, who first met Soderbergh seventeen years ago when he attended college in Baton Rouge; the director subsequently cast him as Nameless Numberheadman in Schizopolis. "Stylistically, Livingston doesn't fit with any of the guys. He's not cool in any way, he's the antithesis of cool. But they need a specialist when it comes to computers and surveillance and he's a specialist. He just doesn't do well with people, which is why he's married to his machines. I think in the script he was described as having a continual flop sweat." Aside from working with Soderbergh again, Jemison was attracted to another aspect of the project. "The appeal for me was that there is not a lot of violence in this film," he says. "There's tension, but hardly any gunplay. It was neat to be part of a big movie with lots of plot turns and cons, but no easy violence." Chinese acrobat Shaobo Qin makes his motion picture debut as Yen, the crew's remarkably agile "grease man." "Yen is named after a kid who was picked on more than any other in my grade school," confesses Griffin. "This is my way of making it up to him." "My specialty is the Chinese pole act and the barrel act, in which I contort my body into a very small cylinder," Qin explains with the aid of a translator. "I was cast mostly because I can do that. They needed somebody who could fit into a very small place and go where no other man could go." "When we hired Shaobo," says Weintraub, "we didn't even know if he could act. We simply needed an acrobat with his particular talent. We were lucky because even though he doesn't speak much English, Steven would give him direction and George would show him things, and he somehow understood and would do it. I'm still not sure if knows what the story is about." Andy Garcia plays Terry Benedict, the target of Danny Ocean's heist. "Benedict is a megalomaniacal control freak and ruthlessly expedient," says Soderbergh. "When he was negotiating with Reuben Tishkoff to take over his hotel and didn't feel they were moving quickly enough, he just cut Tishkoff off at the knees. He didn't think twice and he didn't look back." Garcia was intrigued by the idea of playing such a vibrant villain. "Benedict owns three of the biggest casinos in Las Vegas," Garcia says. "People in that position didn't get there by appointment. He's worked his way up and has a tremendous amount of self-assurance as well as a healthy ego. He's running an empire and likes to be in charge. And he can be ruthless. His character is so strong, so vivid, I thought I could do something with it and have some fun with the role." "Because Terry Benedict is the enemy in the film," says Clooney, "it meant Andy had to come into a room of 11 guys who had been working together and bonding for a long time and be the character nobody likes. That's hard to do. Andy did it with reckless abandon. Between takes we'd be waiting around and making jokes. Then Steven would say ‘Action' and Andy would become this rat. He really made you want to get him!" Andy Garcia's Terry Benedict is the perfect counterpoint for George Clooney's Danny Ocean," states Weintraub. "They're both excellent actors. And you can imagine Julia Roberts' Tess being with Andy and then you can imagine Danny taking her back." Julia Roberts plays Tess Ocean, Danny's ex-wife who has rebuilt her life in the wake of his arrest, working as the curator of Terry Benedict's Bellagio art gallery. We hear you make twenty per film now. "Don't tell Jerry Weintraub, but to work with Steven Soderbergh again, I would have done it for twenty dollars," Roberts says with a laugh. "At our first read-through, Julia couldn't be there and I read her scenes with Ted Griffin — which by the way, didn't work," Clooney says. "When you have other people reading the lines, it's funny. But the minute you put Julia Roberts into the mix, the stakes begin to soar. She just lights up the screen." "When I read the script," Roberts recalls, "I was even more pleased because my part was such great fun. The dialogue is so sharp and exacting, it's like a 1940s movie. Danny and Tess are so precise in the way that they speak to each other that you can see all the levels and emotions that go on between the two of them. "Those scenes were the most fun to play," she reveals. "Except that it was really hard acting with George, because we have similar personalities and are like brother and sister. I'm supposed to be steely and serious and I was laughing like a 12-year old. Around three in the morning one night I think Steven was beginning to ask himself why he had brought these two people to the table together." "Our scenes are really fun," says Clooney, "because they're like an old Howard Hawks film where they're both going at each other and nobody really wins. Which is the way it should be." "George is just this charm monster," Roberts adds. "I spend most of the movie pretending that it has no effect on me whatsoever. Which was fun to do because I'm probably the only girl in the world to do that. It was good to show George what that feels like — when a girl doesn't get weak in the knees and swoon." Roberts also enjoyed exploring the complexities behind her witty, glamorous character. "Steven and George put together the most enticing cast and made me the only girl," Roberts says. "But Tess is more than just the girl. There's intrigue and she has some difficult crosses to bear. All of the relationships in the film are so complicated. Tess and Terry are supposed to be boyfriend-girlfriend, but then Tess has to keep evaluating her relationship with her ex-husband. So nothing is as it seems really. It was interesting to find her way." Soderbergh relished the opportunity to work with Roberts in an altogether different genre. "Part of the fun of having Julia play Tess is that she and I had come off Erin Brockovich, a character who was working class and didn't have a lot of money," Soderbergh says. "In this film, Tess is the classic leading lady. She wears spectacular clothes and is very sophisticated and refined." "I'm sort of a stealth actor in this film," Roberts describes. "I come in, I go out, the boys say nice things about me, they get into fights about me. It's been fabulous." 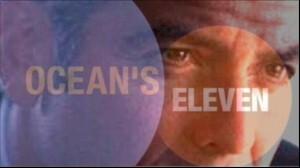 It's a tribute to Steven Soderbergh's impeccable reputation as a director that so many talented actors agreed to come along for the Ocean's Eleven ride, a true ensemble piece, where no one movie star has top billing — on screen or off. "It's a huge cast and nobody ever sits in a kitchen holding a baby talking about things," says Julia Roberts, referring to her role as Erin Brockovich. "It speaks to his love of different kinds of story-telling, and his mastery at it, that he is as calm and tranquil and enjoyable and articulate in this kind of environment. There are lots of nice people I like to spend time with, but if they're not talented, I'd rather just have dinner with them. So, if Steven was a hack, I'd just eat with him and not work with him." "Steven's sets," states George Clooney, "are always easy going. I think more good work gets done when people feel safe and don't feel that they're in jeopardy or that they might offend someone. He's so well prepared that most of the work has been done long before you even show up on the set." For Don Cheadle, the opportunity to return to a Soderbergh set was a pleasure. "It's nice to work with someone you know trusts you and not only trusts you but asks for your input and is interested and curious about your take on things," Cheadle says, "and then incorporates them into the movie. I've never worked with anyone more relaxed than Steven. And he never does. He's able to achieve what he wants without being the 500-pound gorilla on the set." "Steven has marmalade in his veins," Andy Garcia concurs. "He's very placid and extremely focused without being tense. He creates a beautiful space to work in, very open and nurturing. The atmosphere he creates is conducive to doing good work. He's a great listener and truly an actors' director. He appreciates and admires actors and enjoys watching them work." "Steven's directions are very simple, very clean and to the point," says Matt Damon. "Some directors will talk to you for half an hour and I find that somewhat confusing. His direction is visceral and quick. Because he has the entire movie in his head, he can give you his direction clearly. That makes it easy for you to lock into the character." "Part of your job as a director," relates Soderbergh, "is to make it difficult for people to act up. When you come into this environment it's really obvious to everyone if you're acting like a jerk. Our cast was too professional to do anything like that. They wouldn't dream of making somebody's day worse by showing up and misbehaving. "And they really enjoyed each other's company, which is what you hope for," the director continues. "A testament to that is the fact that between takes, the actors would all stay on the set, talking and fooling around while they waited for the camera to be ready. They never went back to their trailers. I always took that as a good sign. Sometimes it was a problem because I would have to interrupt a story or two to get them to come over and actually do some work. Carl Reiner, especially, was the ring-leader. He's got the best stories in the world and he's hilarious. I thought, perhaps as a fellow director, he would be sympathetic to my plight, but I was sorely mistaken. He was holding court quite a bit." According to Reiner, "Steven made two of my favorite movies last year. I am sort of semi-retired but I thought I might act once in a while. I didn't realize I'd be lucky enough to get this good of a job. I've made fifteen films as a director and many as an actor. I have never met a Steven Soderbergh look-alike, act-alike, direct-alike. He's a total original. He never overshoots and he has angles that you would never dream of. He completely trusts his instinct and he's never wrong." "Steven's directing style would work with a small movie, a big movie or grand movie," declares Weintraub. "And he has great skills with actors. He gives them plenty of latitude and doesn't get in their way. He pulls them back if they get off base but he lets them be creative. That's why actors love him. They know he's looking through the lens and not through a monitor. He sees exactly what they're doing and he's cutting it in his mind. "I used to say that Frank Sinatra and Ella Fitzgerald were instruments, not singers," Weintraub adds. "They were part of the orchestra. Soderbergh is a walking camera. He doesn't need Panavision. If he could connect the camera to his brain, he could shoot the movie himself. He sees what you and I don't see. Like Picasso, who would take a blank canvas and paint on it, Steven sees with his eyes things that you and I can't see. He was born with a God-given talent and that talent is he thinks movie. He thinks story. He thinks what his next shot is going to be. He thinks composition. He thinks color. He thinks what's coming next. He just knows it. It's indescribable."